In addition to Dr. Gooi’s 18 publications, he has presented over 30 papers at International and Canadian meetings. He has been invited as a guest lecturer and surgical instructor to over 10 courses at International and Canadian symposia. Dr. Gooi teaches undergraduate students, medical students, and residents in clinic and in the operating room. He has an interest in interdisciplinary collaboration and has partners in Otolaryngology, Plastic Surgery, Spine Surgery, Orthopedics, and Pediatrics. His group currently is the world leader in publications on the use of GoPRO® cameras in Medicine. Gooi P, Ahmed IIK. Pupilloplasty and suturing iris defects. Randleman B, Ahmed IIK. Intraocular lens surgery: selection, complications, and complex cases. Randleman B, Ahmed IIK (eds). New York, NY: Thieme Medical Publishers. Gooi P, Ahmed IIK. Capsule tension rings in intraocular lens surgery. Randleman B, Ahmed IIK. Intraocular lens surgery: selection, complications, and complex cases. Randleman B, Ahmed IIK (eds). New York, NY: Thieme Medical Publishers. Warrian KJ, Kherani A, Gooi A, Gooi P. Surgeon's Point of View Video Recording Technique for Scleral Buckling. Retina. 2014, 34:2151-2. Gooi P, Teichman JC, Ahmed IIK. Sutureless intrascleral fixation of a custom-tailored iris prosthesis with a belt loop anchored three-piece intraocular lens. J Cataract Refract Surg. 2014, 40:1759-63. Arjmand P, Gooi P, Ahmed IIK. Surgical technique for explantation of cosmetic anterior chamber iris implants. Accepted to J Cataract Refract Surg. Gooi P, Ahmed Y, Ahmed IIK. Novel use of a microscope mounted, wide-angle point of view camera to record optimal hand position in ocular surgery. J Cataract Refract Surg. 2014, 40:1071-4. Gooi P, Lukasik T, Ahmed IIK. “Capsular Tension Segments” Expert Techniques in Ophthalmic Surgery. Ed. Crandall AS. Jaypee Medical Publishers, In Print. Gooi P, Ahmed IIK. Review of presbyopic IOLs: multifocal and accommodating IOLs. Int Ophthalmol Clin. 2012 Spring; 52(2):41-50. Gooi P, Farmer J, Hurley B, et al. Cytomegalovirus retinitis mimicking intraocular lymphoma. Clin Ophthalmol. 2008;2(4)969-71. Spitellie P, Jordan DR, Gooi P, Brownstein S, Burns BF. Primary localized amyloidosis simulating a lymphoproliferative disorder. Ophthal Plast Reconstr Surg. 2008; 24(5):417-9. Spitellie P, Jordan DR, Brownstein S, Gooi P, Burns B. Sinonasal undifferentiated carcinoma with a frozen globe. Ophthal Plast Reconstr Surg. 2008;24(3):225-7. Sher JH, Gooi P, Dubinski W, Brownstein S, El-Defrawy S, Nash WA. Comparison of the incidence of opacification of Hydroview hydrogel intraocular lenses with the ophthalmic viscosurgical device used during surgery. J Cataract Refract Surg. 2008; 34(3):459-464. Gooi P, Brownstein S, Rawlings N. Temporal arteritis: a dilemma in clinical and pathological diagnosis. Can J Ophthalmol. 2008; 43(1):119-20. Gooi P, Lee-Wing M, Brownstein S, El-Defrawy S, Jackson WB, Mintsioulis G. Acanthamoeba keratitis: Persistent organisms without inflammation after one year of topical chlorhexidine. Cornea. 2008; 27(2):246-8. Gooi P, Brownstein S, Jackson WB, Mintsioulis G. Meesmann’s corneal dystrophy managed with an epithelial delaminator. Can J Ophthalmol. 2007;42:878-9. Gooi P, Robinson J, Brownstein S, Rocha G. Histopathological and ultrastructural findings in a case of graft failure in Posterior Lamellar Keratoplasty/Deep Lamellar Endothelial Keratoplasty: a clinicopathologic case report. Cornea. 2007;26(7):853-7. 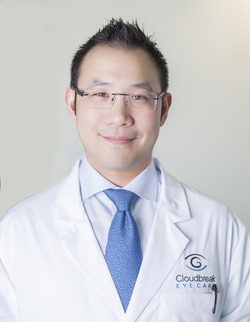 Dr. Gooi’s innovative work in improving glaucoma patient care and medical innovation has led to a number of successfully issued patents. Device, Delivery System, and Method for Ocular Therapy (WO 2016/023116 A1). A novel MicroInvasive Glaucoma Surgery (MIGS) device to treat the trabecular meshwork as well as the post-trabecular outflow system. Surgical Gown with a Functional Window (CA 2851845 A1 – Patent Issued in Canada). Maintains a protective barrier while allowing the user to employ wearable smart technology assets. Orientation System for Image Recording Devices (CA 2859102 – Patent Issued in Canada). Allows one to use wearable, point-of-view cameras and frame and record without the need of a viewfinder.